Are your gums are turning red and puffy? Do your gums start to bleed when you floss or eat hard foods? If you answered yes to either question, you may be showing signs of gum disease. At its worst stage, this oral health condition is known as periodontal disease or periodontitis. But what you absolutely need to know is how dangerous this disease can be if left untreated. Gingivitis: This is the earliest stage of gum disease and occurs when plaque first starts to build on the gumline. This hardens into tartar, which allow bacteria to develop and produce toxins that inflame delicate gum tissue. This inflammation turns your gums red and slightly swollen and cause bleeding when flossing. Periodontal Disease: In this second phase of treatment, inflammation causes the gums to begin separating from the teeth, creating pockets whether food and plaque can become trapped. This provides bacteria a route to the roots of teeth, causing further damage to the smile. Symptoms patients experience as their condition worsens include swelling, gums discoloration, and the appearance of longer teeth. Advanced Periodontitis: During this final stage of gum disease, the bacteria begins to attack the connective tissue and bone that sits beneath the gums. As the soft tissue becomes severely deteriorated, roots are left exposed and teeth become loose and can even fall out. In addition to tooth loss, it becomes harder or painful to chew your food. 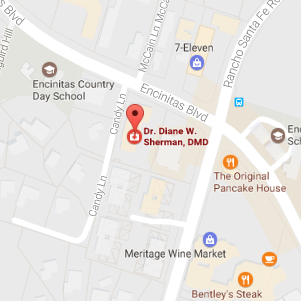 Our goal at Diane W. Sherman, DMD is to prevent you from reaching the level of periodontitis. Even if you show the symptoms of early gum disease, we’ll help guide you towards the treatment you need. Follow the 2 x 2 Rule: The American Dental Association coined the 2 by 2 rule to encourage patients to brush their teeth twice a day for at least two minutes each time. Brush less aggressively: In addition to brushing twice a day, patients should also brush with a soft-bristle toothbrush and move in circles. Floss correctly: When flossing, don’t force the floss deep into the gum tissue. Floss gently, using a C-motion to pull particles up and out of the pockets. Visit the dentist regularly for hygiene cleanings: Each time you visit Dr. Sherman, the goal is to clear your smile of plaque and tartar buildup that you may have missed. It takes specialized tools to clear it all away. But for patients who refuse to go to the dentist, the plaque can quickly worsen. Pregnancy gingivitis is a common occurrence, due to the hormonal changes in a woman’s body. Pregnant women may find their gums feeling more tender and appearing redder. This condition can be prevented from escalating through good oral care, but pregnant women should give their dentist a call if they’re feeling toothaches, bleeding or pain in their mouth. Studies have also shown that the bacteria behind gingivitis can potentially cause premature births. Porphyromonas Gingivalis, also known as p. gingivalis, is one of the main bacteria responsible for gum disease. Recent studies have also shown what damage this bacteria can do to the rest of your body. Atherosclerosis: The p. gingivalis bacteria can trigger inflammation in the linings of arteries. As a result, the combination of this reaction and buildup of cholesterol can lead to heart disease and increased risk of heart attack. Pancreatic Cancer: According to an NYU study, patients with p. gingivalis had a 59% increased risk of developing pancreatic cancer. While pancreatic cancer patients have been known to be susceptible to gum disease, this is the first study to show a possible reverse correlation. Digestive Problems: When p.gingivalis is introduced to the intestinal gut, it changes the chemistry of the good bacteria that digest your food. This also affects proper liver function. Pregnancy Complications: Some consider the most frightening effects of p. gingivalis to be on pregnant women. In one study on mice, this bacteria restricted fetal growth and induced premature births. Even if the warning signs of gum disease are just starting to arise, the best course of action is to speak with Dr. Diane W. Sherman about treatments. Treat the problem now before it worsens! Contact us today to schedule a no-obligation consultation with our dentist and our team.